You can't have a zombie apocalypse or outbreak without any zombies. It's a tough job, but someone has to do it. And if you're one of those people, then Zombies Playground has a wide assortment of different costumes that will transform you into the perfect zombie. Did we mention that playing a zombie is also quite fun? After all, that's the whole point of dressing up, isn't it? 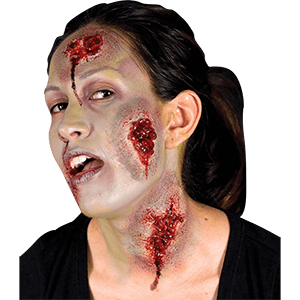 Here in our Costumes section you'll find a wide assortment of deathly costumes that are all a great way to create a quick, easy, and most importantly, a fun zombie look. It doesn't matter whether you're male or female, young or old, we have a selection of zombie costumes here for everyone! And since zombies come from all walks of life, in all shapes and sizes, we endeavor to offer the widest assortment of costumes and masks possible, all to ensure that you can have the zombie look of your undead dreams! Many of our costumes are classic renditions of zombies with either modern or gothic styling, and our masks are all top-notch items that will transform your features into something that is truly ghoulish and monstrous. We even have covers for your hands and your feet, to make sure that your costume is perfectly completed the way you want it to be. Want this Halloween by a zombified family affair? We have matching costumes for the mister and his misses, as well as great costumes for their children, too! It doesn't matter what type of zombie costume you're looking for, here at the Zombies Playground, you can likely find it within our zombie costumes category! Zombies Playground is your one stop shop for everything zombie, so naturally we carry zombie costumes for the whole family! Shop here for adult zombie costumes and childrens zombie costumes in a variety of styles. 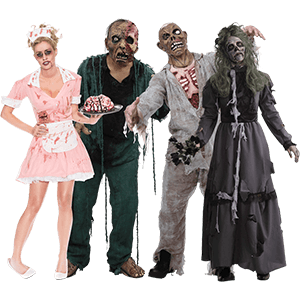 We have scary shambling zombie costumes and zombie costumes where the previous profession of the now zombified is revealed in gory detail, such as in our zombie chef costumes, zombie doctor costumes, and zombie soldier costumes. We have zombie costumes for the whole family here. Some of our womens zombie costumes are hauntingly beautiful, like our zombie prom queen costumes and undead bride costumes, while others take horror to a whole new level. Our mens zombie costumes include zombie knights and zombie pirates as well as more traditional, modern zombie costumes. Kids zombie costumes let little ones get in on the fun of dressing up as a brain-crazed zombie or take on the role of a zombie hunter. For zombie costumes of all kinds, shop Zombies Playground. If you are putting together the look of a zombie survivor or perhaps the outfit of someone who fights back against the zombie horde, our military costumes section is a great place to find the costume for you. Here we carry military costume clothing that will help you get a tactical or survival look for your next zombie walk, Halloween event, or cosplay. We offer military costume items for adults and kids here. 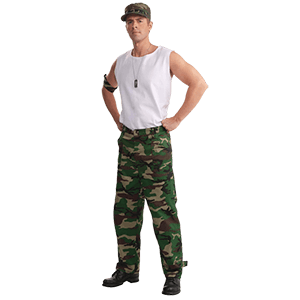 Our military costume clothing includes camo pants, costume combat vests, costume combat boots, and more. Easily achieve a survivalist or military look with all our military and army costume items. We have military costume clothing for men, women, and children here.